Pysy keskiaikaisessa kylässä Sallent de Gallego kaunis Uusittu 1. kerroksen huoneisto, jossa on panoraamanäkymät vuorille ja järvelle. Minuutin päässä parhaista hiihtokeskuksissa Espanjassa, Formigal ja Panticosa. 10 minuuttia Ranskasta. Hiihto ja talviurheilun paratiisi. Kesä hauskaa, vaellus, pyöräily, uinti, melonta ja matkailu. Astu ulos ovesta päälle Camino de Santiago ja Gr 11 pyhiinvaellus ja vaellusreittejä. Nauti kylän elämää kauniissa kaupungissa Sallent. Käy monia nähtävyyksiä alueella. Nauti panoraamanäkymät Asunto. Tämä on ainoa asuinrakennus Sallent kanssa VAIN Alpeilla Sallent kesällä hauskaa! Rakastamme tällä alalla, ei ole muuta paikkaa aivan niin maaginen, rauhallinen ja täynnä seikkailua. Sopii kaikenikäisille, perheille ja ystäville, jokaiselle kaikille. Meidän huoneisto on ihanteellinen ympäri vuoden! Talvella sinun tulee minuutin päässä joitakin parhaista hiihto ja talviurheilu Espanjassa, vielä voi nauttia rauhallinen kylä tunnelma sijaan oleskelevat tungosta hiihtokeskus. On jopa bussikuljetus kylästä, jos et halua ajaa. Keväällä, kesällä ja syksyllä voit nauttia, että olet majoittuessa reunalla kylässä, kävelymatkan päässä ravintoloita, baareja, kauppoja. Voit myös pystyä kävelemään oikealle sivulle lukuisia vaellusreittejä, nauttia vesiurheilua kaunis järvi ja kaikki kesän festivites ja festivaaleilla alueen. Great apartment with elevated views over Sallent and easy walk to the old town with its charm. Excellent apartment with a lovely view over the town and mountains. Short walk in to the town which has a beautiful old town with plenty of restaurants. Apartment has off street parking areas around it. Has an outdoor pool which is great on a hot day.. Sallent is a great area with lots to do. Easy reach of the col de Portalet and France, but also Panticosa and the Tena Valley. Well equipped apartment other than wine glasses ! We really enjoyed our stay. We enjoyed this comfortable apartment and the beautiful views from the balconies and bedrooms. Sallent de Gallego is a gorgeous town and there is a lot to see and do in this region. I recommend this apartment for anyone who would like to explore the Pyrenees! 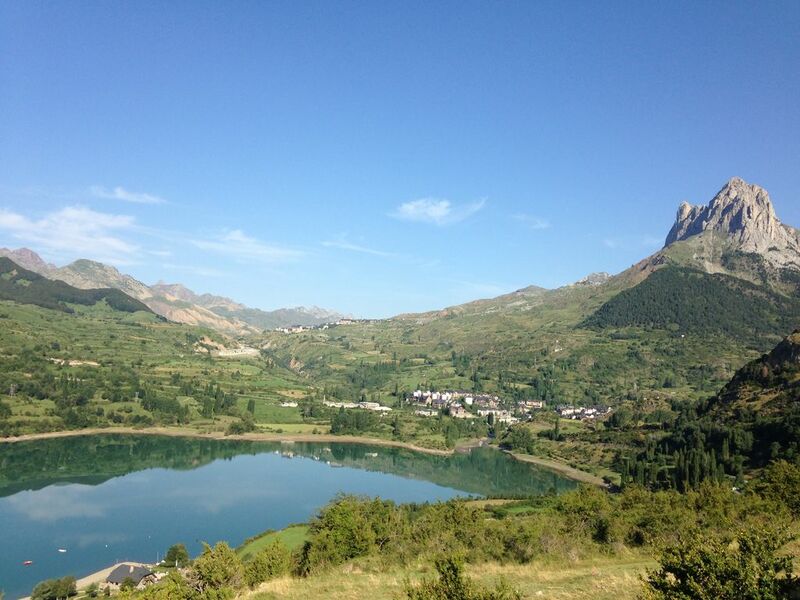 Sallent is an ideal location for exploring the Pyrenees mountains, both by car and on foot. There are trails leading everywhere, including the GR11, which is the principle Spanish trail from one end of the Pyrenees to the other. Some of these trails begin just outside the door of the apartment. This was a very clean and comfortable place to stay. It includes a living room, dining area, two bedrooms, a bathroom, and a small but complete kitchen. The apartment was very comfortable for the three of us staying there, and six of us were very comfortable eating at the large dinner table. The apartment also has a swimming pool, which should be an attractive feature for families in the summer time. A beautiful getaway for an active or passive appreciation of the beauty of the Pyrenees. This apartment offers an unbroken view of the the mountains and direct access to the trails. It offers the feeling of isolation, yet provides easy access to the mountain hamlet of Sallent. and the French border. The apartment itself a very comfortable for just relaxing or reading or sitting on the deck and admiring the views. While we were there in the fall, there were many skiing facilities near by for those who want an active winter vacation. I wonder that I had never heard of this area earlier! The location of the apartment, located in the heart of the Pyrenees mountains and in the center of town, was great for a first time visitor to Sallent. The apartment was clean and cozy and had everything I needed to make the time I stayed inside very comfortable. The views from the balcony were breathtaking. The town itself has very good restaurants and has a brand new sports facility that has squash courts, swimming pools, basketball courts, as well as a spa. In addition, the hiking here was the best hiking I've done out of any place I have visited. The hike from Sara to respimosa was excellent! I highly recommend a trip over here for those who would love to get away from the city. Formigal, a famous ski resort in Spain is located less than a ten minute drive from the apartment and during the winter there are busses traveling there, to and from the town. I can't wait to come back in the winter for some skiing! I highly recommend this place. We flew to Madrid from the US and drove about 4.5 hours to our destination on first class roads the entire distance. Take your GPS. When we arrived we found an excellent apartment with walkable access to restaurants, swimming, hikes, recreation, church and cafes. The balcony overlooks the city of Sallent in one direction and mountains the other. The famous Camino de Santiago trail is in the neighborhood so you have the opportunity to interact with hikers from around the world. There is a small grocery store within walking distance that has everything you need and the prices are very very reasonable. The apartment has two bedrooms with one of them having 2 sets of bunk beds. Devices to hang on the balcony wall for drying clothes worked exceptionally well in the dry mountain air. The furniture, kitchen appliances and washing machine all worked very well. The owner was exceptionally responsive to questions I had before going. This is an excellent property in a great location. We plan to go back next summer. Olemme lähellä sekä Formigal, Anayet ja Panticosan hiihtokeskuksissa. Olemme 10 minuutin päässä Ranskasta. Kävelymatkan päässä järven Lanuza kesän veden toimintaa. Aivan niin Camino de Santiago ja GR11 vaellusreittejä. Yksityinen uima-allas monimutkainen, vain oma uima-allas Sallent.